Getting sick of me talking up my hometown yet? Too bad. Here I go again. There are positive things happening in Galion, and it’s getting easier to spot them on a daily basis. Demolition work has begun on the soon-to-be Tim Horton’s franchise near the corner of Harding Way West and Portland Way. There has been construction tape up for a week and a quick drive-by on Tuesday morning showed growing piles of demolition debris. 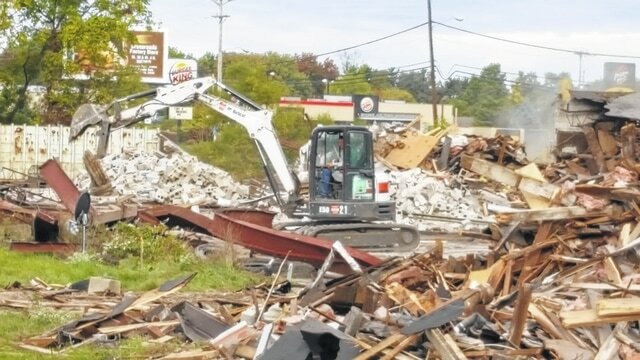 Just a couple of blocks away, construction is underway on a new Arby’s restaurant across the parking from Drug Mart. Arby’s has had a sign up for weeks announcing the fact they’re looking for employees. Even further north on Ohio 598, construction continues on the new Sleep Inn at the corner of Brandt Road and Ohio 598. Perhaps you’ve noticed all the dirt being moved north of the hotel. I did too. Mayor Tom O’Leary confirmed last week that the excavating is part of the infrastructure for the hotel and any new businesses that may end up on that corner. There are pipes being placed in trenches and there will be another water-retention pond on the site. I’ve heard rumor of another company looking at the area, but nothing concrete just yet. Also on Ohio 589, across from the high school, is talk that the former Varsity Grill, formerly Jerry’s Restaurant, may have been sold or is on the verge of being purchased. Again, no announcement yet, so nothing concrete. What this means is that there is a lot of new concrete coming to Galion in the near future. And that’s good news, to most people. Although some in this community fight against altering the status quo. I’m still not going to quit buying chocolate long john’s at Geyer’s, basically the only donuts I’ll purchase anywhere, but a little competition for my breakfast and lunch dollar is not a bad thing. And while I’d love to see some more sit-down type restaurants in town, we’ll get there. There also are positive things happening in the uptown Galion area. New regulations are in place that allow eating and adult beverage consumption on sidewalks in certain areas. In the past, some of those same places have set up places to eat and drink and meet friends in the back of their establishments. That’s fine, but I’d much rather look at traffic on Harding Way than the backs of, well a lot of less-than-attractive buildings and parking areas. Also, there are changes underway that will make it easier for downtown businesses to remodel or fix up their buildings. Although there are good reasons for building and zoning rules and regulations, there has to be a balance struck between maintaining neighborhood continuity and allowing development. Those rules have needed to be changed for years and have actually impeded business growth in the uptown area. While retail is the focus on the north and west and uptown areas, there also is work under way to help the south and east arts of the community, which include more manufacturing facilities. There are projects county-wide that are encouraging middle school and high school students to look into and to consider careers in the manufacturing sector, which has always been the key to Galion’s economy. Those programs, such as WAGE, allow students, teachers and career counselors to visit with and talk to owners and owners and employees about their roles in manufacturing and what it takes to prepare for success in that kind of employment environment. I applaud all these positive changes. I hope you’ll take notice and applaud them, too. Demolition work has started near the corner of Portland Way South and Harding Way West at the future site of Tim Horton’s. Crews were hard at it in their hard hats Tuesday morning. (Photo by Russ Kent). http://aimmedianetwork.com/wp-content/uploads/sites/38/2016/10/web1_russ-kent-mug-4.jpgDemolition work has started near the corner of Portland Way South and Harding Way West at the future site of Tim Horton’s. Crews were hard at it in their hard hats Tuesday morning. (Photo by Russ Kent).